Last week in the mail I got one more gift from my Sainted Paint (known on this blog as X). We received a 60% achievement award from one of my GMO’s. This was from a show back in November of 2008. I got the gift of one last ribbon from a horse who already gave me so much. The anniversary of his death was hard on me. 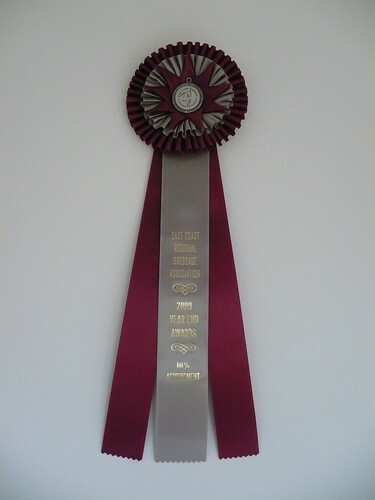 Getting that ribbon reminded me that I never shared how grateful I am to know that wonderful horses. X taught me so much. He was a horse that just gave me so much. I have never known another horse in my life with such a giving spirit. X taught me that some horses really do love to show. He would LOVE to get on the horse trailer. Most horses get nervous, X would get excited. He would literally drag you up the ramp to get on in the morning because he could not wait where he was going. He also loved it when people would watch him in the show ring. The more people watching the more animated his gait would become. He also loved his musical freestyle and I swear he thought it was HIS music. X was a fan of attention and he knew that you got lots of it at horse shows! X taught me that horse shows can be easy. I know it sounds silly now, but I honestly did not know that horses could hang out on a horse trailer. Both Gennyral and Heart were very high strung showers so I had to be with them the whole time I was at a show. That meant that I could not eat or pee all day, which meant that I would get heat sick after almost every show. X showed me that not all horses need constant attention at a show, which made my life at a show FUN. I could take the time to take care of myself and that has made a world of difference to me! X taught me that no matter how old you are a good gallop in the fields can fix anything. Sometimes X and I would get frustrated with each other. Dressage is not easy, especially not for a horse who has arthritis and a bad hip. Progress was not always an uphill climb. Gen and I used to go for a good gallop in the fields when we were frustrated, so one day I tried it with X. I wasn’t sure how the old man would respond, but he LOVED IT! Any time we went for a gallop he would turn into a 3 year old again. He would buck and carry on and really enjoy himself. Even just writing this makes me smile because I can just remember so clearly taking off at the bottom of the hill and flying up it. X taught me how to be still when I ride. That is a lesson that I have clearly not mastered with Phoenix, but it was a real break through for me. Gen and I constantly struggled with contact, but towards the end with X I was really feeling like I got it. I was able to hold my hands still sometimes! That was just such a break through in my ridding and it was such a gift. I cannot thank X enough for that. X taught me that there really are perfect horses out there. I cannot put into words all that he gave. I do know that his legacy will live on in the way I train Phoenix. Knowing what a great horse X was makes me want to teach Phoenix how to be that great. X was one of the most amazing horses I have ever known. I still miss him terribly. He was and always will be the Sainted Paint.